If I were an artist, the colors in this painting would be my palette. 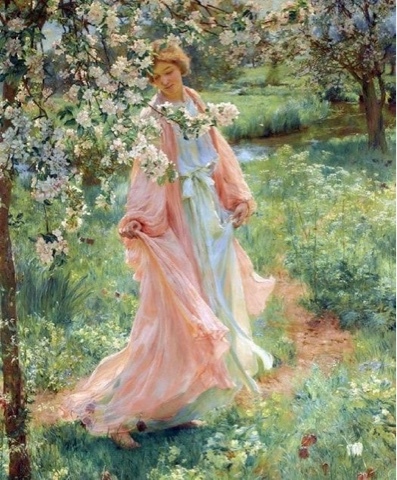 The model is dressed to go with the blossoms, which might be apple or cherry. 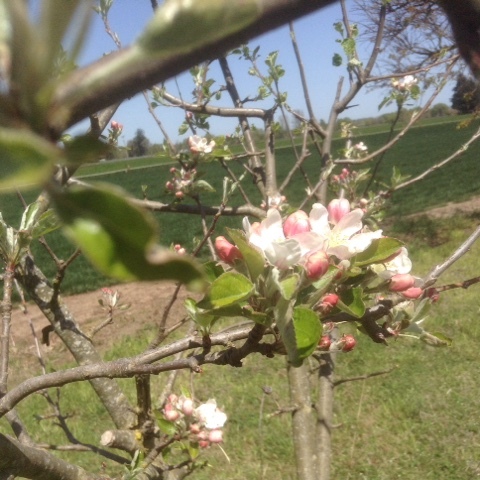 These apple blossoms caught my eye this morning while I was out hanging laundry on the line between two trees. 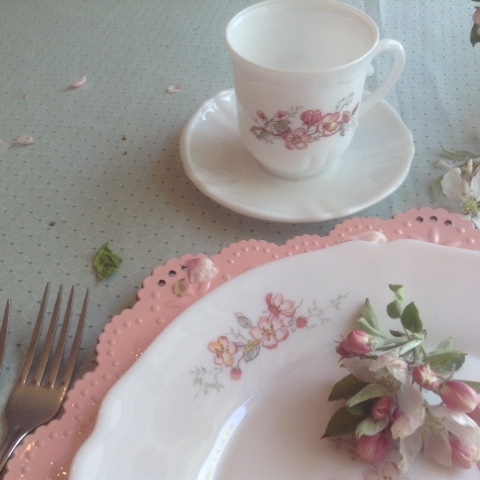 I put them together with my apple blossom Acropal set of dishes. This is a small Victirian style vase which one of my grandchildren likes to use. As soon as she gets here, she gathers all the flowers she can find and gets out my little collection of vases and arranges the flowers in them. Then she places the visual confection all around the house, on ledges, shelves, sills, and tables. Now to look for apple blossom fabric to go with! I'm quite in arrears regarding my sewing but I have not given up. Every lovely sight needs a dress to go with, and maybe a hat. 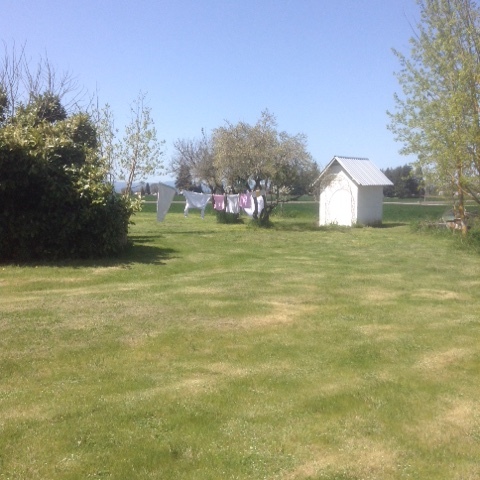 Right now I am busy getting things more trimmed down and organized in a couple of places in the house. I don't want to be on the hoarders top ten list yet! When I have any difficulty getting into some of the harder things, like cleaning up a storage room or a kitchen gone amuck, I enjoy easing into it with smaller tasks first. 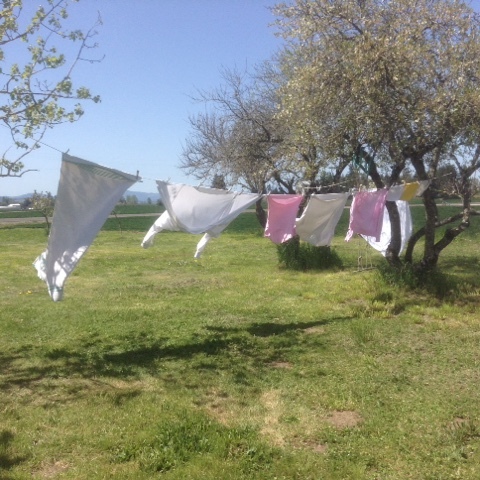 That is why I hung a small load of laundry outside. It was quick to complete and then I could take a bit more effort for something that seemed overwhelming. 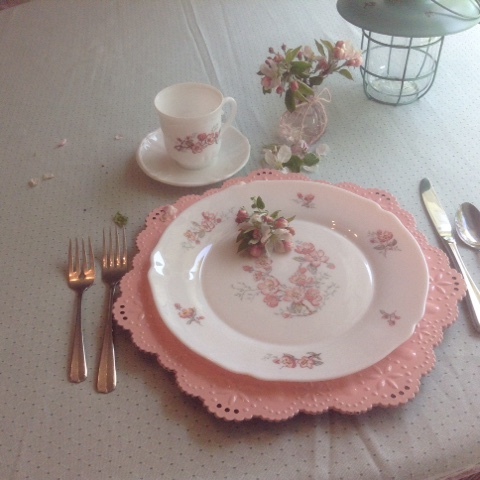 Making this soft table setting vignette was an accomplishable task, and I keep going back to look at it while I am trying to get something less pleasant cleaned up. It gives me hope that my friends won't have to come looking for me in the laundry room. Is t it lovely how the Lord gives us these little reprieves, these small things that are easy and quick to make beautiful. Mr. S. Came in to have a look and said he thought we should always do something we want to do, each day, to make the "should do" list less formidable. He has a peculiar attitude towards the word "obey". He always suggests good things for me to do, such as, "Why don't you get out of the house for awhile and walk around Hobby Lobby," or "While you are at the grocery store, get something extra for yourself," or "I want to go on a trip, but you have to choose all the stops." He did that with the children, too. Mr. S. says a leader is a servant, not a boss. He thinks that since a wife is supposed to be a helper, a husband ought to listen to her cautions and pay attention to things that bother her. If he does not do this, he loses her trust and her helpfulness. He wants people to enjoy themselves and express their opinions. He is the type of person to ease someones burden rather than put burdens on them. I appreciate your comments so much, and I would like to thank you for visiting. Oh Lydia, you have such a jewel of a husband. I know how much you appreciate him. 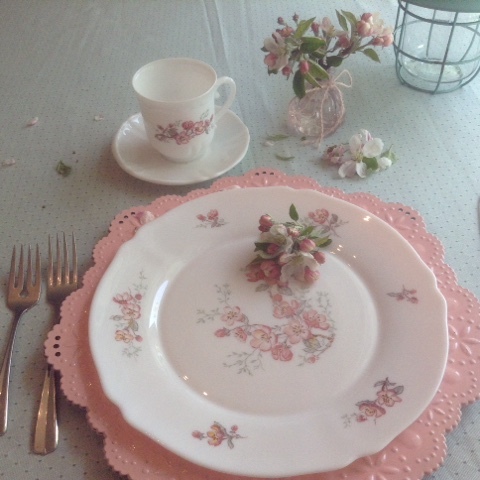 Tor APPLE BLOSSOM China is so beautiful and glad your little granddaughter enjoys gathering flowers for you. My little grands love to gather English daisies and Dandilions for me. 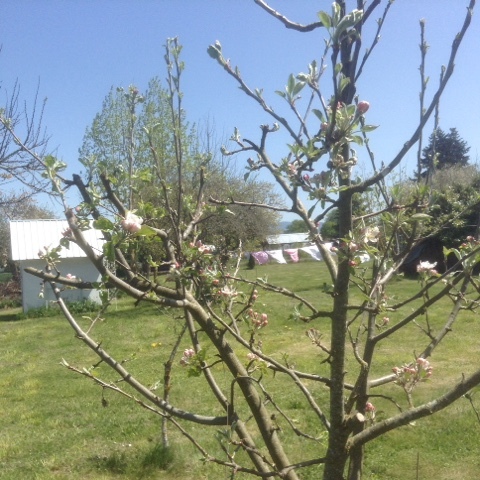 Since I planted my new orchard all the fruit trees are blooming including the tiniest apple trees. I'm so delighted. Janet, thank you. I bought 30 years ago. Willow, I am honored by your visit . Thank you for your comment. 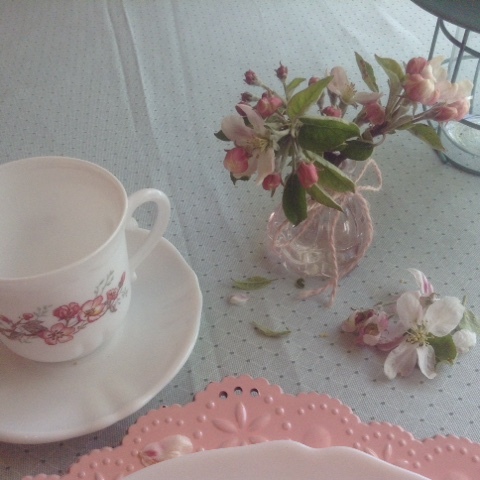 I love the china, apple blossoms are some of my favorites, next to pink lilacs. We had a crab apple tree in our backyard and I honestly thought the thing was deader than a doornail. 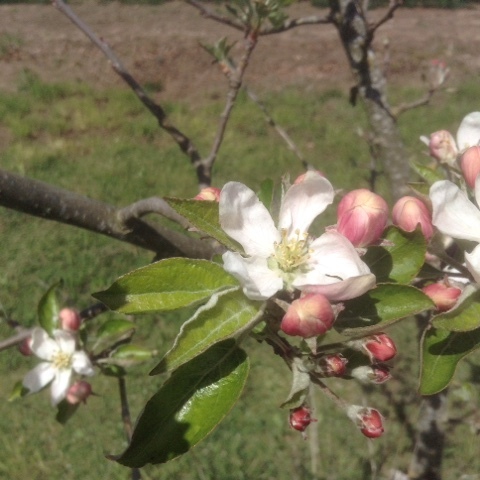 Then spring came and it greened up and soon we had apple blossoms all over the yard. I still smile about it.Darn thing didn't produce much fruit though. Thank you for posting your husband's way of looking at things. More of us should think this way, especially lifting other's burdens. Michelle, there's more stability with a husband who is concerned about the needs and feelings of his wife and pays attention to her instincts, her forebodings, her ideas for the future.